The Kir Royale is a French cocktail that is made of crème de cassis or the juice of a blackcurrant and then topped with champagne. It is a deviation from the other cocktail Kir which is blackcurrant topped with white wine. The cocktail is often had before a meal or snack as an aperitif. The drink was named after a Felix Kir who was a former mayor of the city of Burgundy in France. Variations on the Kir Royale include the Cider Royale which is made with cider instead of wine, Communard which is made with red instead of white wine, the Hibiscus Royale which is made with sparkling wine and peach and raspberry liqueur and a hibiscus and Kir Pamplemousse which is made with red grapefruit juice instead of black currant. To make the Kir Royal you will need 4 tablespoons of Chambord, ¼ cups fresh raspberries, and 1 bottle of French champagne, chilled. 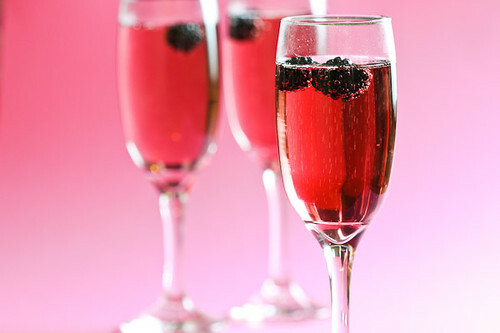 Place the 4 champagne flutes in a freezer for 15 minutes and remove and add 1 tablespoon of Chambord to each flute. Add a few raspberries and top with champagne. Serve while chilled.